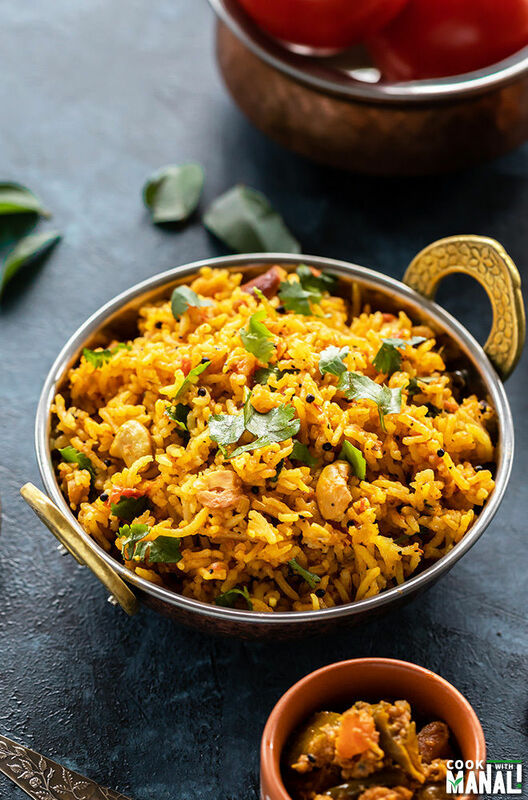 South Indian style Tomato Rice with lots of spices! This is favorite way to make tomato rice, it tastes so good with pickle and a side of yogurt! It’s also known as Thakkali Sadam in Tamil. 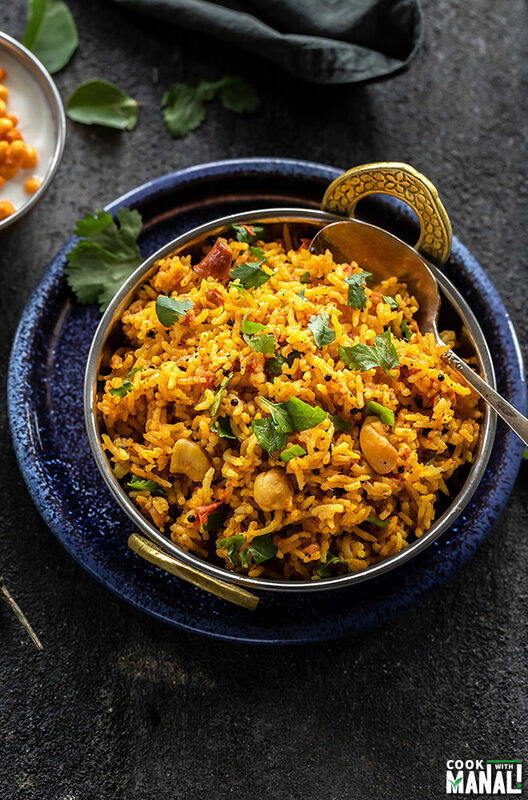 Rice is such an integral part of Indian cuisine. It’s literally eaten in every corner of the country. I have shared quite a bit of Indian rice recipe on the blog but of course there is so much more that I have not shared. Today I am sharing one of my favorite rice recipe – tomato rice. 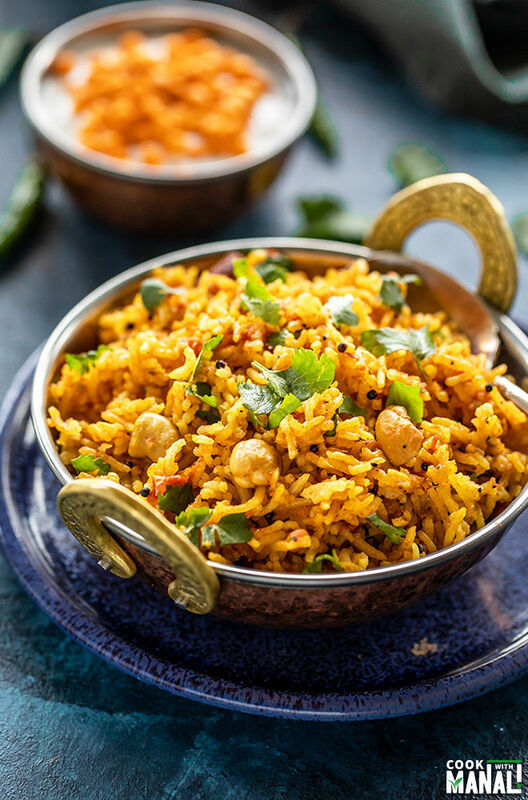 This spicy rice is particularly famous in South India but of course it’s cooked and relished everywhere. 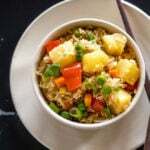 There are two ways to make this rice – one you can make it from raw rice and cook from scratch and second is to make it with pre-cooked rice. This recipe uses raw rice but I also have instructions to make it with pre-cooked rice. It’s simply rice cooked with lots of tomatoes and lots of spices. I really went overboard with tomatoes in this recipe because I wanted the flavors of tomato to shine through. Using 3 tomatoes was just not cutting it so I have used 4 large tomatoes here which was around 500 grams. This rice is seasoned with curry leaves, mustard seeds, green chilies, garam masala, black pepper, chili powder and also some whole spices! Usually tomato rice is very spicy and people enjoy it that way. However keeping in mind my taste buds, my tomato rice is not that spicy. I guess for those who have been following my blog for a while are well aware of this, I do not eat very spicy food so as always adjust spice levels to taste. To make this tomato rice really spicy, use 1/2 teaspoon garam masala, 1/2 teaspoon black pepper and 1/2 teaspoon red chili powder. I have used only 1/4 teaspoon of each in this recipe. I used my regular stove-top pressure cooker to make this rice. To make sure you end up with a pot of perfectly cooked tomato rice, keep these things in mind! ✓ Soak the rice for 20 to 25 minutes before adding it to the pressure cooker. This is important. 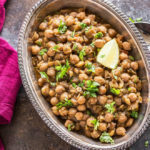 Also soak the chana and urad dal for 10-15 minutes before using them in the recipe. 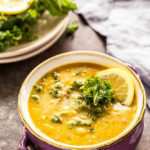 When you soak the dal, it is soft and nice when cooked. ✓ Use 1 1/2 to 1 3/4 cups water per cup of raw rice. If you add 1 1/2 cups, the rice grains will be well separated. For a softer rice consistency, use 1 3/4 cups of water. Keep in mind for this water ratio to work, you have to soak the rice in water for 20-25 minutes. ✓ Tomato rice definitely tastes great with ghee. So you may use ghee in stead of oil here. However if you want to keep it vegan, stick with the oil. ✓ If you have soaked the rice, add 1.25 cups water and use the rice button with natural pressure release. ✓ If you haven’t soaked the rice, use 1.5 cups water and use the rice button with natural pressure release. 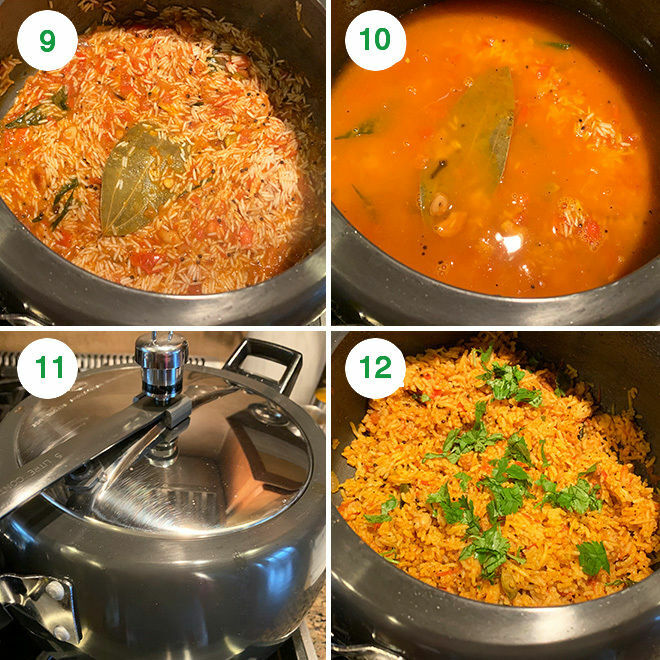 If you don’t have a pressure cooker and want to make tomato rice on stove-top, follow the same steps until adding the rice and water. Once you add the water, cover the pan with a lid. Cook on medium heat for 10 to 15 minutes or until the water is absorbed and rice is cooked. Fluff the rice with a fork once done. 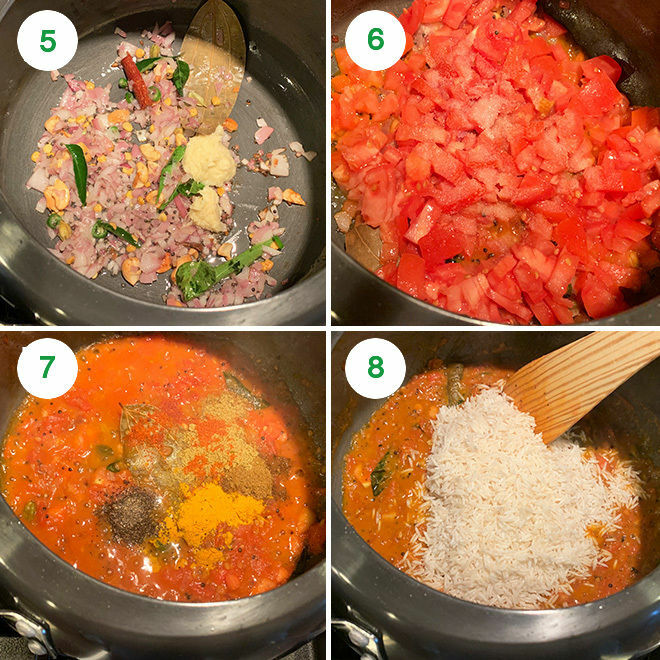 Follow the same steps until cooking the tomatoes and adding the spices. At the last step add cooked rice (around 3 cups cooked rice) and mix. If mixture looks dry you can add some water but mostly you will not need any water. Let everything heat through and serve. This tomato rice tastes best with raita. I enjoyed it with some onion raita on the side, so good! You can also serve it with a side of plain yogurt. 1- Rinse the rice (I have used basmati rice) until water turns clear. Soak it in 2 cups of water for 20 to 25 minutes. Then drain the water from the rice using a colander. Set aside. Also soak the chana dal for 10 minutes and then drain the water and set aside. 2- Heat oil in a pressure cooker on medium heat. Once the oil is hot, add the bay leaf, green cardamom, cloves and cinnamon stick. Also add the mustard seeds. Wait until the mustard seeds pop and you get nice aroma of the spices. 3- Then add the chana dal and cashew to the pot. Cook for a minute until the cashews and dal start changing color. 4- Add the chopped onion, green chili and curry leaves. 5- Cook for 2 minutes until onions become soft and translucent. Then add the ginger-garlic paste and cook for a minute. 6- Add the the chopped tomatoes along with salt and mix. Cook the tomatoes for 6 to 7 minutes until they turn soft and mushy. 7- Then add the spices turmeric powder, garam masala, coriander powder, black pepper and red chili powder. Stir and cook the spices with the masala for a minute. 8- Add the rinsed and drained rice to the cooker. 9- Toss the rice until it’s well combined with the tomato masala. 10- Add the water. Use 1 1/2 cups – 1 3/4 cups water. Use 1 3/4 cups for softer rice and 1 1/2 cups if you want the rice grains more separated. 11- Close the cooker and cook on medium heat for 2 whistles. Then lower the heat to lowest and cook for 2 more minutes. 12- Turn off the heat and let the pressure release on its own. Open the cooker and fluff the rice with a fork. Garnish with cilantro. Serve spicy tomato rice with a side of yogurt and pickle! 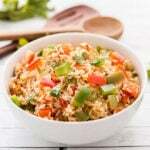 If you’ve tried this Tomato Rice Recipe then don’t forget to rate the recipe! You can also follow me on Facebook, Instagram to see what’s latest in my kitchen! 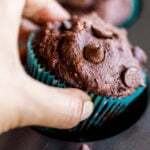 This post has been updated from the recipe archives, first published in 2016. 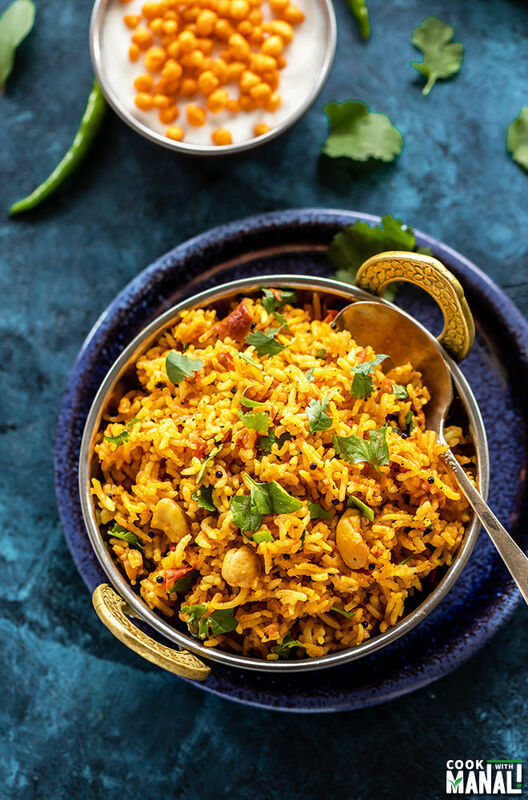 One-pot spicy South-Indian style Tomato Rice. 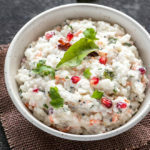 This rice is best enjoyed with a side of yogurt & pickle! Vegan & gluten-free! Rinse the rice (I have used basmati rice) until water turns clear. Soak it in 2 cups of water for 20 to 25 minutes. Then drain the water from the rice using a colander. Set aside. Also soak the chana dal for 10 minutes and then drain the water and set aside. Heat oil in a pressure cooker on medium heat. Once the oil is hot, add the bay leaf, green cardamom, cloves and cinnamon stick. Also add the mustard seeds. Then add the chana dal and cashew to the pot. Cook for a minute until the cashews and dal start changing color. Add the chopped onion, green chili and curry leaves. Cook for 2 minutes until onions become soft and translucent. Then add the ginger-garlic paste and cook for a minute. Add the the chopped tomatoes along with salt and mix. Cook the tomatoes for 6 to 7 minutes until they turn soft and mushy. Then add the spices turmeric powder, garam masala, coriander powder, black pepper and red chili powder. Stir and cook the spices with the masala for a minute. Add the rinsed and drained rice to the cooker. Toss the rice until it's well combined with the tomato masala. Add the water. Use 1 1/2 cups - 1 3/4 cups water. 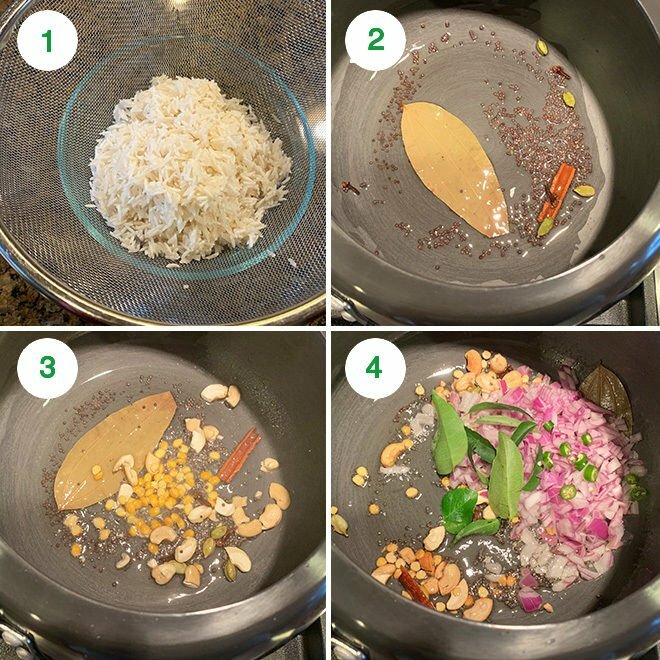 Use 1 3/4 cups for softer rice and 1 1/2 cups if you want the rice grains more separated. Close the cooker and cook on medium heat for 2 whistles. Then lower the heat to lowest and cook for 2 more minutes. Turn off the heat and let the pressure release on its own. Open the cooker and fluff the rice with a fork. Garnish with cilantro. I love the presentation of this rice, Manali! 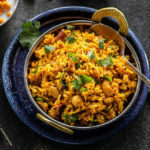 I am always looking for ways to jazz up rice, so I will have to try this version. Love the flavors in here! Thank you Gayle! you will love it! This rice looks amazing! 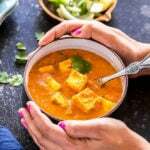 I really like the flavors of the garam masala and ginger paste in here! So fluffy and great and i love it spicy! Wow – such a flavorful dish! I’m a big fan of rice….especially when it’s all dressed up with exciting flavors! Delicious!! Rice is so important and I love how it pops up in a ton of cultures in different ways. I’ve never had tomato rice before, so now I have to give it a shot! Love this tomato rice! We often make rice soaked in tomato juice instead of water to really bring out the tomato flavor. Can’t wait to try your recipe! Rice is one of my favorite foods in the world! Love how flavorful and delicious this dish is! Sounds so good! what a great idea. i’ve never ever think about this before. it’s simple to make but seems very tasty and healthy. 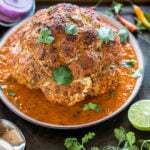 i love Indian cuisine so much and i love all your recipe , too. Love one pot meals and an absolute fan of tomato rice. Looks so delicious, Manali. One more version of tomato rice to try. The Tamil word saadam is derived from Skt word prasadam. Rice is used often as naivedya in Tamil Nadu temples.